Executive summary: W.S. Farish & Co. While one of the wealthiest men in Texas (fortune derived from Humble Oil, co-founded by his grandfather), he is extremely secretive. Close personal friend of George H.W. Bush, and a heavy Republican donor. Gave Bush their pet dog Millie, and he is the one who managed the then-Vice President's assets in a blind trust. Queen Elizabeth II has been a guest at Farish's horse ranch (Lane's End Farm near Lexington, Kentucky), and their horses breed with each other -- Farish is a horse breeder at the highest level, including winners of the Belmont, Preakness, and Kentucky Derby; he also for a time was Chairman of the Board of Churchill Downs. 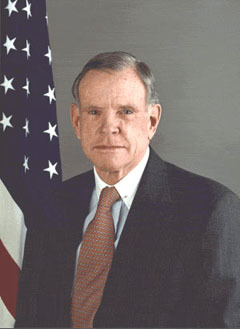 From 2001 to 2004 he served as US Ambassador to Great Britain, including during September 11 and aftermath.